(Photo: Osservatore Romanot)Pope Francis received a refugee's teapot as an invitation to work together for the suffering neighbor when he met a group from the Lutheran World Federation. It is almost 500 years since Martin Luther was at the forefront of the Reformation that later pitted Catholics and Protestants against one another for many years. The Pope said that confronting the historical reality of the Reformation is important as it enables Catholics and Lutherans to rejoice together "in the longing for unity which the Lord has awakened in our hearts, and which makes us look with hope to the future." Leaders of the 70-million strong Lutheran World Federation and representatives from the Lutheran-Roman Catholic International Commission on Unity met with the Pope and Vatican officials. They discussed joint efforts to strengthen their commitments to the poor and vulnerable around the world. Federation members presented Pope Francis with a teapot from a Somali refugee woman at Dadaab, the world's largest refugee camp. There administration is run by the LWF's diaconical arm, its Department of World Service. "As people who have been met by Christ, we are freed and sent to meet our suffering neighbor. Let this gift therefore be an invitation to do more together for the sake of the suffering," noted LWF general secretary, Rev. Martin Junge. 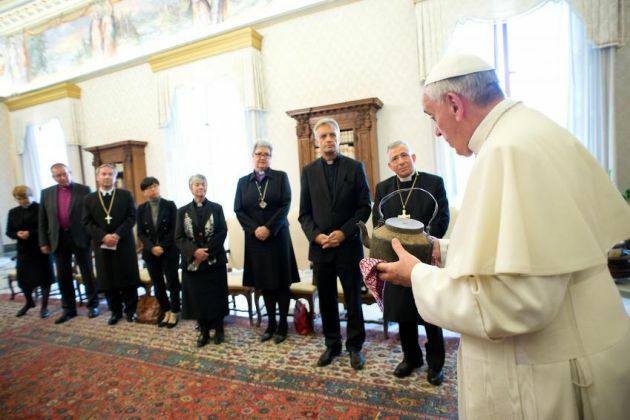 Francis accepted the gift saying he will keep the gift "as a reminder of this dimension of ecumenism, the ecumenism of martyrdom," Lutheran World Information said in a statement. He added that persecution "does not know denominational barriers. Religious divisions do not define people fleeing conflict or migrating in order to safeguard their own lives. They are ultimately defined by what they are: children of God." Lutheran World Federation president, Bishop Munib A. Younan, expressed gratitude to Pope Francis during the meeting for the ecumenical milestones of the partnership with Catholics. 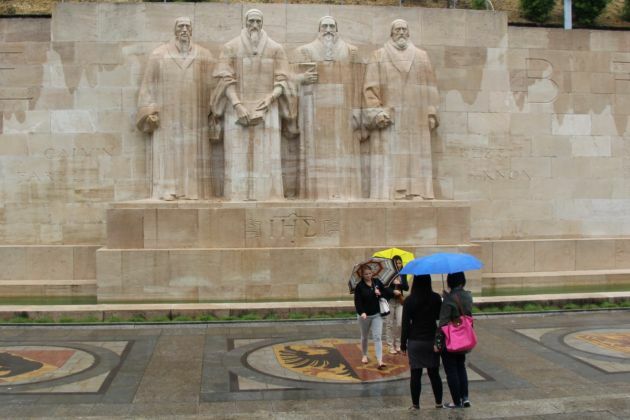 In a June 2013 report by the Lutheran-Roman Catholic Commission on Unity, the partners worked together at a global level to tell the history of the Reformation as part of their commitment to deepen Christian unity. This year marks the 50th anniversary of theological dialogue between the two partners. The 500th anniversary of the Reformation is also quickly approaching in 2017. The Lutheran-Roman Catholic Commission on Unity has published a text, "From Conflict to Communion: The Lutheran-Catholic Interpretation of the Reformation in 2017," Ecumenical News reported on June 18. The document, according to Bishop Younan, "provides an opportunity to reflect on our particular history – now worded jointly by Lutherans and Roman Catholics – so we can correct our behavior and engage one another more constructively for the sake of God's mission." Cardinal Kurt Koch, a Catholic representative had added, "Now we have been able to see that Martin Luther wanted a renewal of the Church and not a new Church." During the meeting Monday, Pope Francis stated, "Catholics and Lutherans can ask forgiveness for the harm they have done to each other and for their guilt before God, and together rejoice for the nostalgia for unity that the Lord has reawakened in our hearts, and which makes us look ahead with hope." The Pope continued, "Certainly, there are and there will be difficulties, which will require further patience, dialogue, and mutual comprehension, but let us not be afraid! "Unity is not primarily the result of our efforts, but of the action of the Holy Spirit, to which we must open our hearts with trust in order that it might lead us along the paths to reconciliation and communion."